Family meal planning around our house usually involves the same go-to meals — a general repeat of the ones we know and like. I actually love to cook and prepare meals for my family. 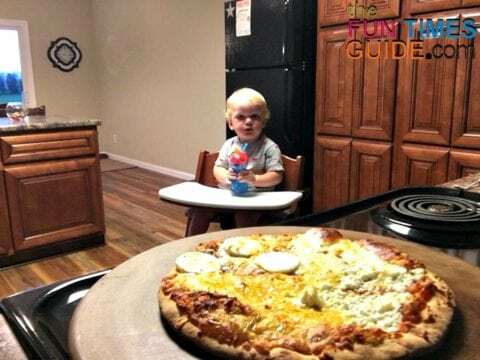 But sometimes it just doesn’t always work out for a variety of life reasons — especially with a toddler. 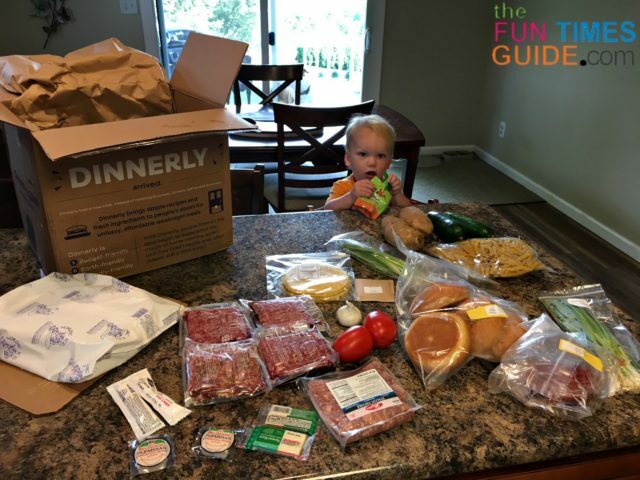 After I’d heard nothing but great reviews about the meal delivery service called Dinnerly from my mother and sister-in-law, it peaked my interest as a chance to switch up our family meal menus. My sister-in-law sent me a link for a free box, so I decided to sign up and give it a try. Dinnerly delivers all the fresh ingredients needed to create 3 weeknight meals — direct to my doorstep — for $5 a serving plus $8.99 shipping. Their whole gimmick is to deliver simple recipes and fresh ingredients for affordable weeknight cooking amongst the busyness of our lives. Basically, they try to keep each recipe down to 6 ingredients and 6 steps — with a fresh, fully cooked meal in 30 minutes or less. Each week, they give me 6 different meals to choose from and I have to narrow my selection down to 3. This is great, because it means menu options — especially since I know there are certain things my husband won’t eat. I have never tried any other meal subscription services before — but it was never from a lack of interest. I always found them too pricey when I investigated similar meal delivery sites like Blue Apron, Hello Fresh and Plated. I don’t know how Dinnerly compares to the competition these days, because I haven’t researched meal subscription services in over a year. With Dinnerly, at $5 a serving, I feel this is a great price point to get all of the fresh ingredients delivered to me. 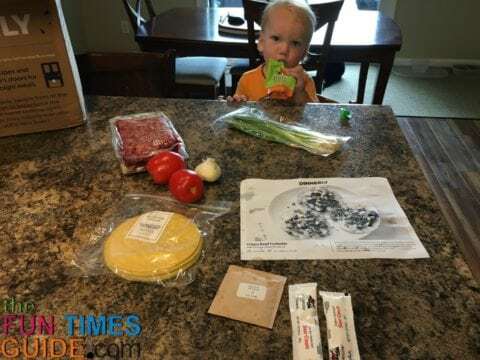 A meal delivery service like this makes it easy to create a new variety of family meals. I really love that there is no commitment too. I can cancel anytime, or skip a week — if we are going to be out of town. It’s a truly flexible subscription which allows me to pick & choose the meals I want up to 2 months in advance. The Dinnerly meals are available in either a 2-serving or 4-serving box. Baby is eating solid foods and joins in our meals. I like to have leftovers for lunch the next day. 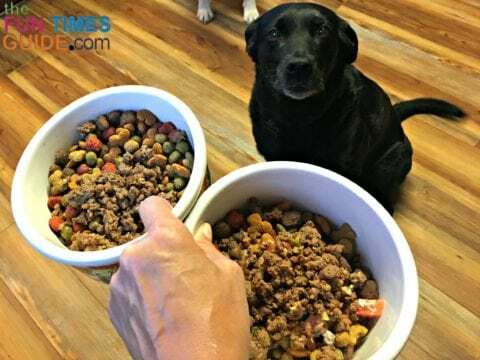 I also give the dogs some of our leftover food mixed in with their dry dog food. My sister-in-law subscribes to the Dinnerly 4 serving box and she has a family of 6 (2 adults, 4 kids). She says that she incorporates a salad of some kind to each meal and always has more than enough food. I’ve found the Dinnerly recipes are relatively simple to prepare, although they do require some minimal prep — such as washing and chopping fresh produce. But I like to prepare my own food anyway. I love how all the recipes take 30 minutes or less. All the meal kits come with good quality ingredients — such as fresh produce, grass-fed beef, and antibiotic-free chicken. Your Dinnerly box arrives on the day of the week and the timeframe of your choosing. The food that they ship is prepared to stay cold for up to 30 hours — if you happened to miscalculate your delivery time. The ice packs are made of 98% water and 2% super absorbent polymer, which is non-toxic & non-hazardous. The bags can be cut open and recycled after the ice is melted and drained. TIP: We like to keep a few of these ice packs in the freezer to use later — like in the cooler when we’re traveling! To keep their costs affordable, Dinnerly does not include recipe cards in the box — like some of the other meal kit delivery companies do. So I print out my upcoming recipes from the Dinnerly website. I may even start a 3-ring binder to keep all the recipes for future meal inspiration. But you can easily view the recipes on any device as you’re cooking – if you don’t want to print the recipes. However, they do tell you in advance exactly what you will need to prepare the meal. They also have suggestions on some of the recipes — such as garlic bread or a salad to take your meal to the next level. Read all the recipe directions first. Have everything that’s required for the meal ready to go before you start. Watch everything as it cooks (especially in the oven). I imagine all oven temperatures are slightly different. As an example, even though I followed the instructions, I burnt the tortilla shells at 8 minutes even though the recipe calls for 10 to 15 minutes. Luckily, I had extra tortillas on hand to save the meal. 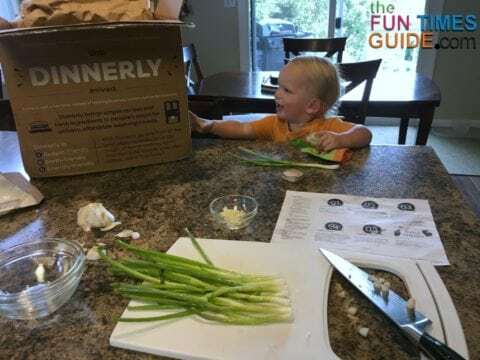 I received a free Dinnerly box — but not to write this review, nor am I affiliated with Dinnerly. I’m just a MaMa sharing my experiences trying new things. I did, however, get a link to share and gift a free box to 3 friends after my first delivery (everyone gets this). I think Dinnerly does a great job with their word-of-mouth marketing by incentivizing their customers to keep giving a box. After all, that’s how I signed up and became a customer. So far, I’m enjoying creating a new variety of meals for my family. I always look forward to seeing which meals are on upcoming week’s menu. I definitely encourage you to give it a try and spice things up with your family meal planning.